A double chin makes you look older and heavier, no matter your age or weight. Unfortunately, this type of fat doesn't respond well to diet and exercise because genetics is often the cause. Hailed as the biggest innovation since Botox, Kybella is the first FDA approved treatment for submental fullness, or double chin. 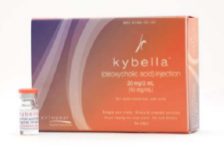 Kybella, more commonly known as Deoxycholic Acid, is injected into the fat pad under the chin. The results are permanent: once the fat cells die, they do not grow back. Kybella also tightens the skin under the chin. Kybella is performed through a series of treatments in our medi spa. We recommend spacing injections six weeks apart. Most patients have five days of swelling, tenderness and redness. Also, most usually see noticeable results only after their second treatment. Recovery after Kybella treatment is much quicker and easier than the alternative, liposuction. Renu Laser & Skin Care offers Kybella near Littleton, Co. Kybella offers savings through the Brilliant Distinctions® program. For more information, please contact us at (303) 470-0200.